75% lamb and chicken. Grain free. Complete meal, grain free for adult dogs. 100% natural with added vitamins. Nutritionally balanced - chicken and lamb are a great source of protein that is easy to digest and highly palatable. Vegetables - a brilliant source of essential vitamins, minerals, fibre and natural antioxidants. 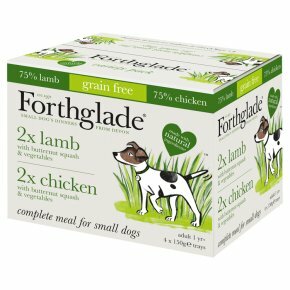 Grain Free - we don't add any grains to this recipe, so it's great for dogs with sensitive tummies. Botanicals - natural herbs to help aid the body's natural defences. Minerals, vitamins & prebiotics - with chelated minerals to help improve nutrient absorption, and prebiotics to help support an increase in 'good' gut bacteria. Omega-3 - increased levels of omega-3 fatty acids, to help support immunity and encourage a healthy skin and coat. Gently steamed - we add a little water to help cook everything slowly and at a low temperature, to retain all the natural goodness.